It’s the perfect time of year for cables! They’re so fun to knit, too. Thick, squishy warm socks out of Dream in Color Classy, in Purple Rain. With the leftovers from the socks, I whipped up an earband this week – I just LOVE those cables, and this should hold me over until I make a new hat! Not that it’s actually been cold out or anything, it’s supposed to go up to 6C tomorrow. 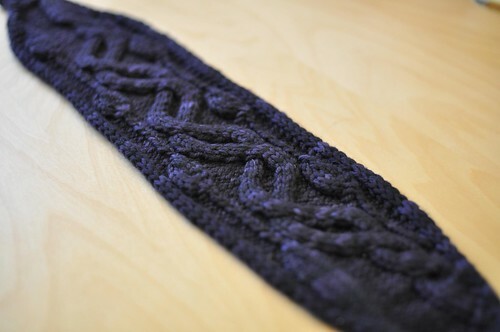 Patterns for both the socks and earband are mine, and will be published soon. Too bad it’s not for me! 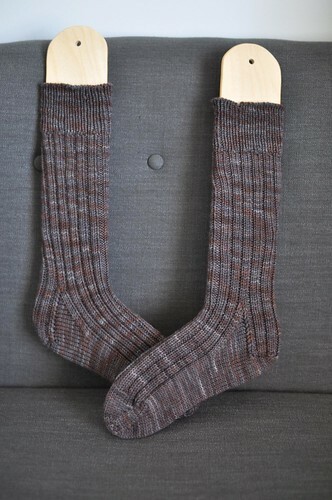 One pair of long, thick socks in Dream in Color Classy, colour Cocoa Kiss – a perfect blend of grey and brown. So cushy, too! I worked these on 3.25mm needles for a good dense fabric, over 52 sts. 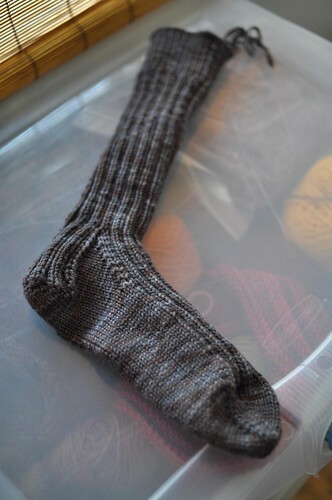 You can’t see in the photo, but I continued the ribbing down the back of the heel flap as well. Well. I still have a week, right? P.S. 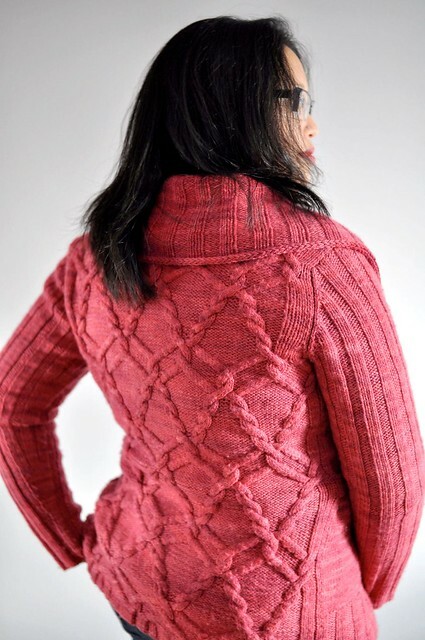 Stay tuned – I have a new pattern and a pattern sale coming up! Yikes, I didn’t realize it was SO close until I counted! Rhiiiiiiinebeck! 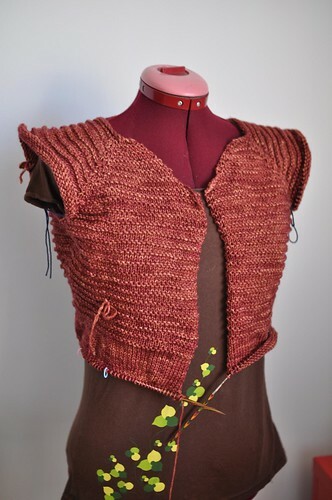 I’m past the yoke divide and I’m about halfway through the waist decreases. 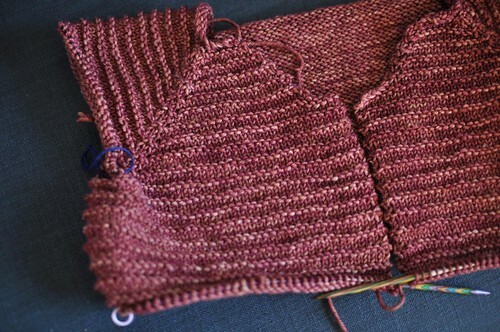 I’m pretty happy with how it’s turning out – the yarn is so pretty, and it knits up fast because it’s aran weight! The other one, well, it’s still quite a blob. 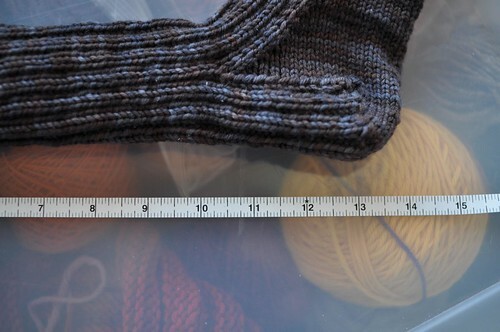 We shall see how much knitting I get in the next 2 weeks…there’s so much else I have to do! 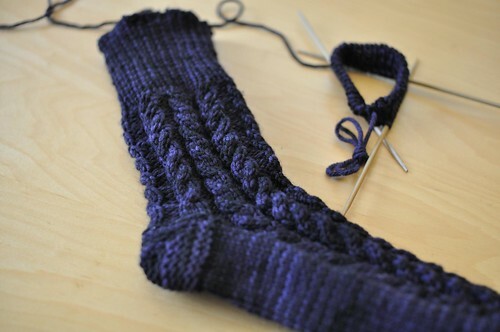 I’m also working on a pair of Rhinebeck socks, not for me but for my fella – they’re out of Dream in Color Classy, so they’ll be cozy and warm for wearing while hanging out at the house we’re renting. They’re really, really long too. How long? 13″ from the top of the cuff to the bottom of the heel flap. It’s a good thing these are worsted weight, they’re still going pretty quickly! I might need to use a bit of a second skein of yarn though, because they’re so long. Also! I’m having a destash sale to make room for Rhinebeck purchases, so if you’re in the market for some awesome yarn, take a look and email me at cosmicpluto at cosmicpluto dot com if you’re interested in taking anything off my hands.